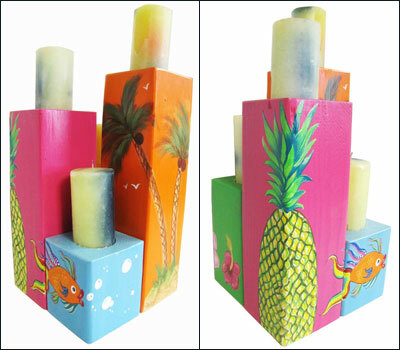 This set of four Hawaiian theme wooden candle holders comes complete with four candles. They are painted in bright beautiful colors and feature a pineapple, palm trees, a fish, and Hibiscus flowers. These candle holders were hand painted by Marj Serr and are one-of-a-kind. The width of each individual candle holder is 3.25". The height of the shortest candle holder is 4.5" and the height of the tallest is 9".